1. Name and identify 4 different kinds of boats. 2. Listen to the story Who Sank the Boat?, and make predictions. 3. Use prior knowledge to choose animals that weigh more or less on a pocket chart. 4. Explore with water play and sail boats for hands-on discovery. 5. Construct a boat that floats from clay or aluminum foil. 6. Experiment in water to see what the boat holds and still floats; record the results. Who Sank the Boat? by Pamela Allen, large pocket chart, sentence strips and picture cards,large plastic storage containers, water, aluminum foil, modeling clay, plastic bear counters, prediction sheet ditto. 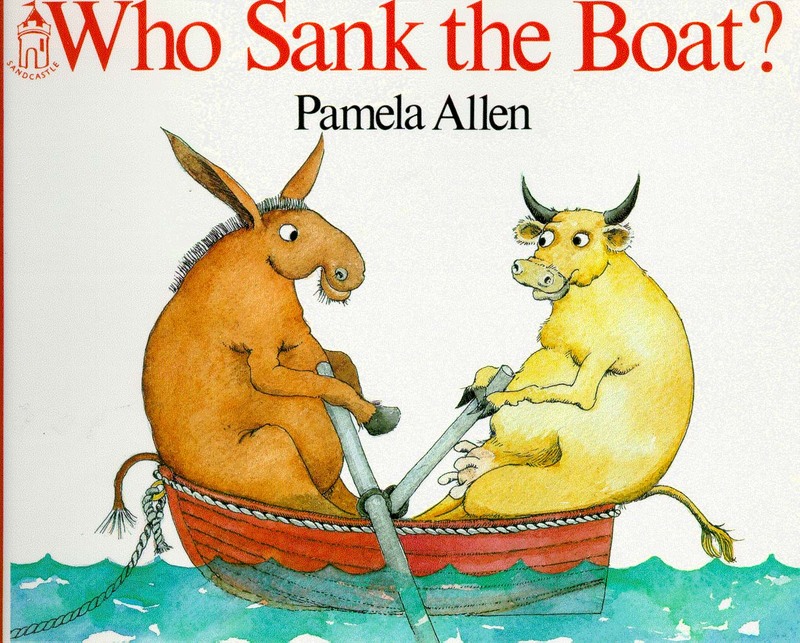 *Use pictures of different kinds of boats to name and identify orally as a group. *Listen to the story Who Sank the Boat? by Pamela Allen, and make predictions as you read. *Use sentence strips on a pocket chart: Was it the ____? NO. Use picture cards that match the story in the blanks. Read orally as a group and spell "NO" each time. *Use a mouse finger puppet to say: "I'm as tiny as can be, but I sank the boat....how can that be?" Brainstorm ideas how the tiniest animal in the story could sink the boat. *Use a tub of water and plastic sailboats/tugboats in small groups to explore and float boats. *Add plastic bear counters to each boat to see how many bears it will hold. *Individually construct a boat that floats from modeling clay or aluminum foil. Test it in the water one at a time so everyone can see everyone else's design. *As children are constructing, the teacher will use a digital video camera to record the final products. *Students will record their prediction and actual number on the ditto. They need to add one bear at a time to their boat. Circle that number on the ditto. second blank (prediction was in the first blank). *Orally discuss and compare class results about how the construction of the boat made a difference. *Construction of a floatable boat. Materials needed: bananas, red and green seedless grapes, pineapple chunks, toothpicks, paper plates, lemon juice and sugar in a small spray bottle. *Children need to peel one banana and throw the peel in the garbage and place the banana on their paper plate. * The fruit on the toothpicks are the "sails" for the banana boat. Have them angle the banana with the ends aiming up and stick the sails into the banana where they wish. *Spray the banana boat with the lemon juice/sugar mixture .